Banting for vegetarians since they can be obese too. Banting for vegetarians has come about because there are a lot of people who can't, or won't, eat a diet that is very high in animal protein and fat. There are in any case serious questions about the wisdom of following such a diet plan, even though it may be quite successful in helping you to lose weight, and control your blood sugar. The greatest single difficulty, to my mind, however is not the animal products, but the complete banning of legumes because of their carbohydrate content. To eat only red meat and strictly avoid chickpeas, lentils, peas and beans, for example, is highly questionable, and in any case, extremely distasteful to vegans. New research is coming out all the time that trans fats, and not red meat and dairy are the villains of the piece when it comes to heart disease. Butter is in, and the host of foods like margarine to which the food industry adds chemically altered oils are out. So, in that respect, classical banting is not so way out. The usual Banting diet is not only high in animal fat and protein, but also very low in carbohydrate; the reason is to put you into a state close to ketosis. In my humble opinion, this isn't necessary. It's the starches with a high glycemic index that we need to studiously avoid; they are the foods that produce an insulin rush and cause our bodies to store the excess blood glucose as fat. This opens a window of opportunity for banters who are also vegetarians. So, how about eggs Florentine for breakfast? We enjoy it almost every morning of the week; it's part of the reason that neither Helen nor myself have a weight problem; and hardly ever need to consult a medical doctor; let your food be your medicine. 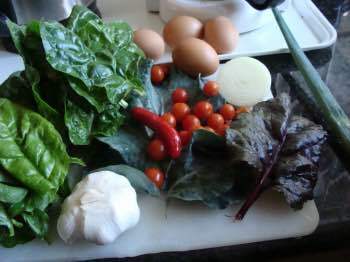 These are the ingredients for eggs florentine that could easily form the delicious breakfast of all banting vegetarians, and meat eaters too for that matter. One of the joys of greens like this is that you won't be one of the five million Americans who are blind, and another ten partially sighted because of lutein macular degeneration. That together with zeaxanthin are two carotenoids that are vitally found in the retina giving protection against high energy light entering the eye and damaging the cones in the macula; a deficiency will make you go blind. Those vegetarians who are banting will be pleased to know these phytochemicals are best absorbed with extra fat, so enjoy the butter. Have it on half a slice of low GI bread, toasted, with extra butter. Butter is back and should never have been sent packing. Alternatively enjoy these olive oil health benefits. Banting for vegetarians can be done without a diet high in animal fat and protein; it will mean cutting out all the refined carbohydrate though, something we should all do anyway. Vegans and vegetarians get their proteins from legumes like green peas, hummus, beans and pulses. They do have some carbohydrate but it is universally in the very low glycemic index category. And that makes them not only acceptable, but also highly desirable. Enjoy your legumes without guilt or distress. Vegetarians can also be obese if they eat starches with a high glycemic index. The problem children are not the legumes, but their sweet tooth and a liking for white rice and potatoes. White bread rolls and scones, bagels, chocolate cake and colas are also problematic; these are the foods that make us obese. More difficult are the carbohydrates that do not have a high glycemic index but certainly do contain starch. Banting for vegetarians allows most fruit, but in moderation, and likewise sweet potatoes and butternut; green peas and beans are unlimited in my book. 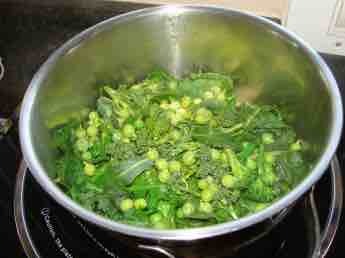 Just plop two eggs on this spinach, broccoli and green peas mix. Swiss chard is often used too. high in legumes like green peas. high in olive oil and avocado. moderate in cheese and eggs. moderate in 100% wholewheat bread and pasta. moderate in starches like butternut and sweet potato. low in generally available whole wheat products which in fact are mostly 60% or more refined. very low in white rice, white bread and even potato. extremely low in white flour products like chocolate cake and cookies. zero in colas and beer. Much has to do with whether you are Banting for vegetarians just to be more healthy or, on the other hand have a serious medical issue like diabetes or obesity; then you have to be far more strict with the starches. Obesity kills twice as many people on earth as starvation. It does that in many ways, often not considered is that they are highly likely to have major surgery to hips, knees and ankles, all of which comes with risks. I prefer to think in principles rather than precise measurements. Forget weighing out how much of this or that you may have, and I have nothing to say about exactly how many eggs you may have. Also take care not to become the proverbial health nut neurotic; when eating out enjoy your meal but perhaps only take a tablespoon of white rice, a small helping of ice cream, and a half roll with your soup. At home be much stricter. Following this banting for vegetarians you may only lose at half the rate of the classical meat, lard and butter diet, but is it sustainable? Remember that research shows that 95% of dieters are as heavy or heavier one year later. So, it's taken you thirty years to get so heavy. Is it a problem if it takes six months to get it off, instead of three? With this banting for vegetarians you know it's basically a healthy and sustainable diet. Enjoy your food, take more walks as the pounds come off, and don't get neurotic about it. Low GI bread is an important part of the banting for vegetarians diet; because of the chickpeas paste that's added, it's not offensive to those who eschew animal products. This low GI easy sourdough bread recipe can be enjoyed in moderation. Two slices a day perhaps, with butter. Shun margarine and in fact all foods with trans fats. Simply adding a scoop of vegetable protein to the dough, like hummus for example, lowers the glycemic index; and extra fat like olive oil or butter lowers it further still. Both low GI and sourdough bread are very simple to make. It takes me six minutes every morning, including grinding the flour and tending to the starter; I've timed it. 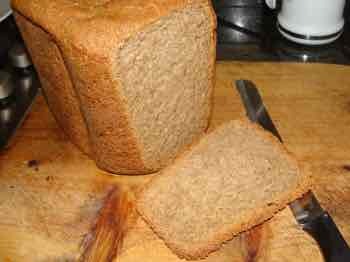 If you are going to take the trouble to make low GI bread, then use only the best ingredients; that means healthy flour. I find it incredible that bakers can use flour that has had up to 40% of the goodies removed, and yet still call it wholewheat. 100% whole meal contains the lignins and vitamins that our bodies urgently need; anything less is really processed junk food to one degree or another. Quick hummus is something every family should do regularly; the main ingredient is chickpeas. It's inexpensive, and takes me only five minutes; it's loaded with the vitamins and minerals to keep homocysteine levels down, and will lower the glycemic index of any starch like bread; perfect for those Banting for vegetarians. For example, very occasionally you might break down and have a baked potato with butter and quick hummus. It readily fulfills the basic amino acid needs of those banting for vegetarians. Tofu nutrition too should have a place in Banting for vegetarians; it's high in protein and fat, and low in carbohydrate. Healthy living tips are for those who are seriously tired of being sick, taking medication and visiting doctors; and are willing to ring in some important changes to their diet; they fit neatly with those who are interested in Banting for vegetarians. I don't need to speak to vegetarians about healthy living tips, except perhaps in regard a balanced amino acid regimen. If you're eating hummus and eggs then you'll have no problem but, for newbies, adequate methionine and lysine is vital, otherwise you'll get a serious disease called kwashiorkor. Banting for vegetarians is not something to be done in a spurious manner; it can have serious consequences if not scientifically done. If in doubt, get advice from a registered dietician. Vegans need to be particularly careful not to be come anaemic due to a vitamin B12 deficiency. No amount of chiropractic help will suffice if you get pernicious anaemia. Another potential problem is insufficient omega-3; fatty fish is the best source, freshly ground flaxseed and true free range eggs have three times as much. Alternatively, if you're a wacky greenie like me, one of the many chicken tractor designs that can be moved around your garden is an option. Our healthy living tips are one of our most popular pages; afraid of change? Don't be; our slogan is slow food made fast. Most of these recipes are easy. Make a start with quick hummus. Go from Banting for vegetarians to olive bread recipe.